Jersey City continues to make headlines for its ongoing efforts to improve pedestrian safety. InTransition Magazine talks about those efforts in their latest issue and features Central Avenue in its cover photo. To learn more about this demonstration project, please read Jersey City's Pedestrian Enhancement Plan. Central Ave's Reusable Tote Bags Are Back! Effective July 1, 2019, the City of Jersey City will prohibit the use of disposable plastic carryout bags (see City Ordinance 18-065 for details). In response, Central Avenue businesses (via their SID program) are working together to make our fourth annual Reusable tote bag campaign the largest giveaway yet. Central Avenue businesses have produced and disturbed nearly 6,000 tote bags during the past three years (2015-2018). Great job by Jersey City art students and teachers! There were nearly 145 students from 15 different schools citywide painting on 96 storefront windows in our shopping district. Central Avenue businesses are happy to host this annual event giving kids in grades 4th through 8th a chance to experience what it is like to install public art. Which is your favorite portrait? Take a photo and tag us on social media to share your picks. There are 20 winners in all and teachers notified the students if they have been selected. Awards were handed out on Saturday, October 27th at a small award ceremony at 107 Bowers Gallery and Artspace. List of 2018 Window Painting Contest Winners. Jersey Journal - Students decorate Central Ave for Halloween. 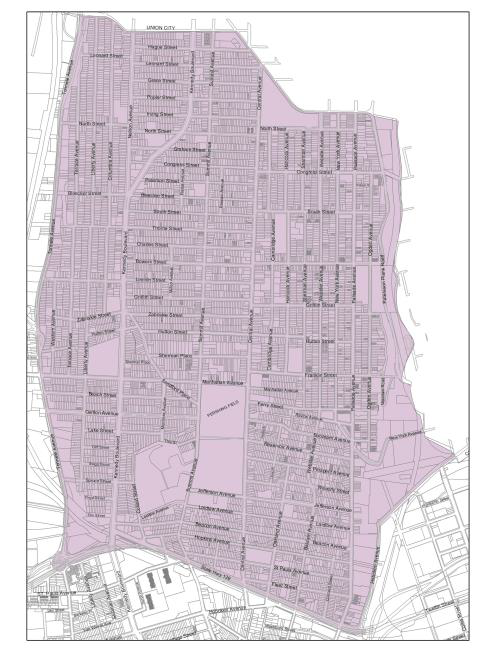 Parking Zone 16 encompasses all of The Heights neighborhood (Map). Any vehicles without Zone 16 permit parked in the zone over 4 hours (outside meter hours) may get towed. As of November 2018, zone parking enforcement will be 24 hours a day, 6 days a week (excluding Sundays). Permits are required (from Midnight Sunday through 11:59 pm Saturday night) for all residents and area workers parked in the zone over 4 hours. Permits for the new parking zone can be obtained online or at the Parking Enforcement Division Office, located at 394 Central Ave, Jersey City. Permit fees are established by City Ordinance 17-033. For more information, visit the City of Jersey City website. In September 2017, many came together to participate at the one day "Parklet" demonstration near Dulce De Leche Bakery/ Gino's Pizzeria & Restaurant. The demonstration centered on a new study for a Jersey City Pedestrian Enhancement Plan (campaign known as JC Walks). Jersey City has launched this study to understand how to make streets better for walking. Enhancing the pedestrian environment will make it more attractive and safer for residents and visitors to walk around the city. The final report is now available online. Check out the section on Central Avenue on pages 62-67. Photos from JCWalks Central Avenue workshop. The property owners at 506 Central have announced their intention to invest a large amount of money into our main street community. With an aging building stock that is nearly 130 years old, Central Avenue desperately needs all the upgrades and investment it can receive. The currently building is home to C-Town Supermarket and does not have residential units. The owner has hired Lee Levine Architects to design and present a five story building that includes 20 new residential units, 10 parking spaces, a green roof, and newly redesigned storefront with bi-fold doors to attract a new commercial tenant. This project has gathered input and support from various community groups, including the CASID, and the necessary variances won approval from the City's Zoning Board on May 24th. The CASID thanks the property owner and LLA for considering our feedback on this project as the CASID proudly endorse this major investment in our shopping district. In honor of Small Business Week, the City of Jersey City kicked off the week by honoring 18 small businesses at this year's Small Business Service Awards. Congratulations to all of the winners at this year's Small Business Service Awards especially Central Ave's own Salerno Salumeria (453A Central) for receiving an Anchor Award and Dulce De Leche Bakery (376 Central) for receiving a Pioneer Award. The Jersey City Small Business Service Awards honored 9 long-standing small businesses and 9 new small businesses citywide. Businesses were nominated by their respective Ward City Council member or the Council-At-Large members. Special thanks to Suraj from the Sneaker Room for moderating the discussion. For the full story, check out the news coverage in The Hudson Reporter. [See Event Photos]. The City Council approved a resolution (17-913) last November that would initiate a redevelopment study on the site of the proposed parking deck on Central Avenue. The Division of Planning is expected to present the study to the City Council soon for approval moving the project into the next phase. The third annual "Central Avenue Auto and Music Show," was a grand success. We thank all of the performers, volunteers, participants, partners, and event sponsors for bringing the fun filled family event to the Jersey City Heights main street. Check out the event page or see the news story in the Jersey Journal for a look back at the event. New Public Artwork In The District by Sam Pullin - "Earth Person 2"
Citywide Campaign Promoting "Buy Local"
Good news Jersey City! The Central Ave SID program was successfully extended through 2020 at the October 4th Special Meeting of the Corporation. Our SID is one of the few in New Jersey which periodically holds a referendum vote asking SID members (commercial property and/ or business owners in the district that fund the program through an assessment) if they want to continue it. Members voted almost unanimously in favor of the SID. Many thanks to all CASID members that took the time to participate in the referendum vote allowing the organization to continue investing, serving, and growing our neighborhood and business community for another four years. Fun Fact: Out of the 10 commercial corridors in Jersey City, Central Avenue has the most trees. In total, The Heights neighborhood main street has 113 tree beds. The Jersey City DPW and Office of Innovation partnered together with CASID to get 16 new male Ginkgo trees planted in the shopping district last year. In addition to requesting adjacent business owners help water the trees, CASID started an online campaign asking local residents to adopt one of the new trees and bring it water a few times a week during the evening hours. This was a community approach to care for our community trees (#TreeSpeech). I was always curious about the people who actually live on the Avenue and what it was like, I reached out to David Diaz the Central Avenue District manager and he set up an interview with two longtime Jersey City residents; Bob Iezzi and Erin Delaney. Bob is an OG Jersey Citian, that has been living on the avenue for decades and he is also a business owner. Erin Delaney is a local photographer that I’ve been following for a while as she takes a lot of great Jersey City photos from food, to landscape and events, she is everywhere! Erin even took some great behind the scenes photos of my interview with Bob! [Read More]. More photos on Facebook via CASID and HDSID. Beginning Saturday April 12, 2014, the northbound travel lanes on the Route 1&9 Pulaski Skyway will be closed for approximately 24 months while the New Jersey Department of Transportation (NJDOT) rehabilitates the bridge deck. Additionally, Route 139 Upper Level will be closed and detours through local streets will occur starting in May 2014. This major rehabilitation project will directly affect Hudson County's midsection (between the Holland and Lincoln Tunnels) including The Heights and Journal Square sections of Jersey City. Please stay up to date on the project as it progresses and plan accordingly. Read more about how this major rehabilitation project will affect you. Originally scheduled for the third Saturday each May, the Everything Jersey City Festival will not return in 2014. The Central Avenue Special Improvement District hosted and organized the popular one day event for five consecutive years (2008 – 2012). With an estimated 39,000 visitors in attendance at the last EJCF, Jersey City had the honor of being home to one of the largest main street festivals in the State of New Jersey. The CASID's longstanding sidewalk sweeping program will officially come to an end on January 28, 2013. Making matters worse, the organization behind the popular Everything Jersey City Festival may no longer have the necessary manpower to organize the event in 2013.